This summer, Venezuela was poised to assume the rotating presidency of Mercosur, a trade bloc that includes Brazil, Argentina, Paraguay and Uruguay. But at the urging of Paraguay, Mercosur heads of state are considering blocking Venezuela, at least temporarily, citing the erosion of democracy there. 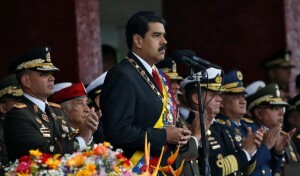 This shows that neighboring countries are starting to take a harder line against Venezuela’s president, Nicolás Maduro, whose authoritarian and reckless policies have plunged his country into economic and political crisis. It follows a hearing last month at the Organization of American States in Washington during which Secretary General Luis Almagro criticized Mr. Maduro for using the courts, which he packed with allies, to thwart the opposition-controlled parliament and for arbitrarily detaining political prisoners. Democratic governance is a requirement for Mercosur membership. The bloc briefly suspended Paraguay in 2012 over the impeachment of President Fernando Lugo by its Congress, which some regional leaders saw as a coup. Paraguay now argues, with good reason, that Venezuela’s disregard for democratic principles cannot go unaddressed. “You can be elected democratically but lose legitimacy over time through your actions,” Eladio Loizaga Caballero, the foreign minister of Paraguay, said in an interview. “We can’t condone any action that silences dissident voices through judicial processes” that are unfair. The growing international condemnation of Mr. Maduro’s government comes as opposition politicians are seeking to hold a referendum this year that could cut his term short. The president appears determined to block the referendum from taking place. Instead of seeking to find common ground with the opposition to address soaring inflation and rising poverty, Mr. Maduro outrageously suggested late last month that he might dissolve the National Assembly. Meanwhile, authorities in Venezuela have indefinitely postponed an appeals hearing for Leopoldo López, the nation’s most prominent political prisoner, who is serving a 14-year sentence on bogus charges. While Mr. Maduro has dismissed his critics from abroad, saying they are part of a right-wing conspiracy, he is clearly concerned about his government’s growing pariah status. He recently expressed a desire to improve relations with the United States, which has been his go-to scapegoat. It’s uncertain that strong and sustained international pressure on Mr. Maduro will make him more responsible and conciliatory. But it could galvanize Venezuelans who are struggling to attain peaceful change. The leaders of Mercosur and allied governments can call on Mr. Maduro to take basic steps to avoid further international scorn. These steps might include the immediate release of all political prisoners, allowing the referendum to take place this year and permitting the delivery of humanitarian aid in areas afflicted by shortages of food and medicine. A firm, principled position would benefit the entire hemisphere.